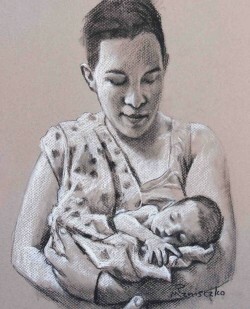 My dear friend Jason Zwiker asked me to create a couple charcoals sketches from photographs he had. I decided to go with the toned paper, with conte. I love the look of these drawings and am hoping to have the opportunity to more like them. 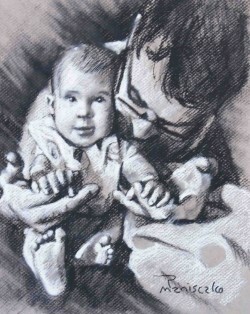 Also, I think the idea of sketching babies with mom or dad or Grandpa or whoever relating to the living miracle in their arms, rather than being featured as another person in a “portrait” a brilliant concept. Artistically, it provides a focus and emotionally, it tells the story of a parent’s love and awe for the greatest gift God can give a person. I will be offering these 9″ x 12″ sketches as a special through spring for $650, regularly $1,200.